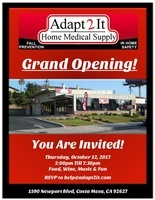 Adapt 2 It is a premier Medical Supply store owned by an OT and an Engineer. We have the opportunity to change our customer's lives by providing assistance to them to adapt to their life situations caused by changes due to injury, illness, or aging. We are solution based and are creative problem solvers. We accommodate to our customers needs and are equipped to handle challenging situations. Our focus is on safe adaptations of personal environments, community and professional training and education, and providing quality Home Medical equipment to improve quality of life.